Gray and Steve’s musical chemistry and songwriting talents were undeniable, and would be the driving force behind the band’s success. The other key factor in the rise of These Four Walls was their tight, heavy and energetic live performances, which immediately caught the attention of hundreds of music fans and continued to grow and evolve with the music. By 2007, These Four Walls were ready to introduce themselves to a larger audience. 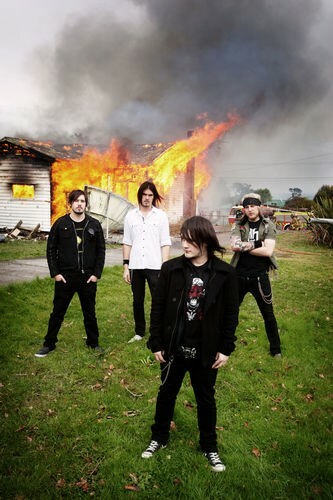 Their first single Walk Away was released early in the year, and gradually built momentum on The Rock FM and Kiwi FM as well as local stations Bayrock and The Zone. When the music video was released in May, the momentum picked up and Walk Away received significant airplay on both radio and television. It broke into the NZ Top 40, was featured on the Rock FM top 30 for 12 weeks and in 2008 was featured at #965 in the Rock FMs ‘Rock 1000 Countdown’ as the only song by an unsigned artist. 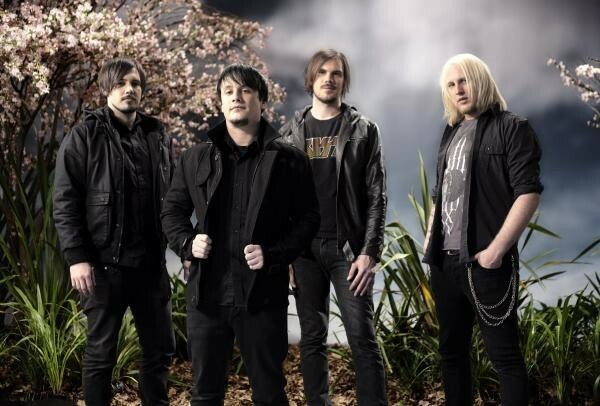 The band’s next release, Under The Shadows, was equally successful when released in late 2007, peaking at #18 on the NZ Top 40 chart, continuing to gain the band airplay on radio and television, and marked the band’s first appearance on The Edge FM. These Four Walls’ third release, Fly Home, was again successful in raising the profile of the group and, as the third consecutive single to break into the NZ Top 40 chart, was the song that helped to win the band a Phase 4 album grant from NZ on Air. In late 2008 These Four Walls signed a promotion & distribution deal with Isaac Promotions/ Universal Music NZ to release their debut album Down Falls An Empire throughout New Zealand. They began pre-production in January 2009 with Chris Van De Geer (Stellar*, Solstate, Revolver) and in May began recording with Chris and veteran producer/engineer Andrew Buckton (The D4, Steriogram, Midnight Youth). Down Falls An Empire is a bold, artistic statement from the band. It’s musically diverse, yet thematically consistent, taking the listener on a journey and presenting itself as a single piece of art as opposed to just a collection of songs. Ambitious for a debut album, the songs range in style from powerful guitar-driven anthems to melodic and beautiful passages but throughout the band retain their individuality and identity. The band’s devoted and constantly growing fanbase was hungry for new music, and when Down Falls An Empire was released for pre-sale through www.amplifier.co.nz they flooded to the site, setting a new record for online pre-sales in New Zealand. The album was released on September 14, 2009 and debuted at #22 on the national album charts. The lead single Sweet December has performed extremely well on radio and TV and has featured on the Rock Radio and NZ Top 40 charts for over 3 months. Down Falls An Empire has been received extremely well by existing fans of the band, and has generated many new followers as well. The album has received a multitude of positive reviews in the media and has presented the band with a number of opportunities, including opening for Nickelback at Vector Arena, featuring Sweet December on the Jim Beam 40 Shots of Rock compilation and performing at the Big Sound 09 summit in Brisbane.